Does my airport have an Eagle 2 Lifter? Great question! Thanks to Tony Clough, carer and volunteer Changing Places campaigner, we have found that not a lot of UK airports actually have an Eagle 2 Lifter, which is a terrible shame. Which UK airports have Eagle 2 Lifters? How do I book an Eagle 2 Lifter? Whether you have used the service before. What’s it like to use an Eagle 2 lifter? We took to good old Twitter to see what UK travellers had to say about the Eagle 2 lifters, or the lack of them! The @Eagle2EU seems to be the safest and most dignified way of transferring to and from the airplane seat . There is no manual handling involved . Unfortunately @DublinAirport does not use it . This is an important subject, one that we feel very strongly about here at Airport Parking Shop. 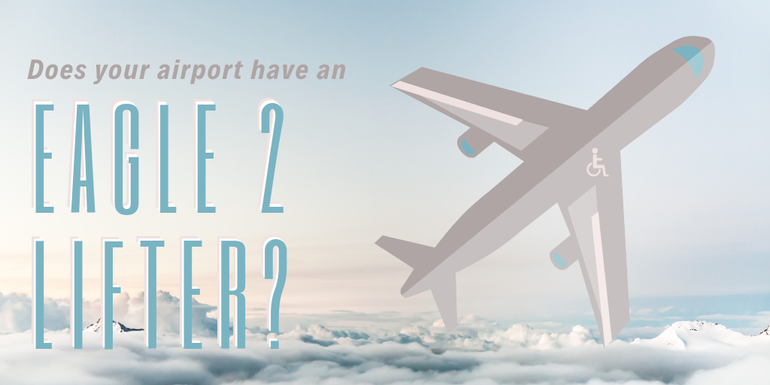 Encouragingly, more UK airports have Changing Places facilities than they do Eagle 2 Lifters, so perhaps this will spark an upwards trend of more Eagle 2s being available across the country; we can only hope! Have you ever used an Eagle 2 Lifter as a PRM? Perhaps you’re cabin crew who has had experience transporting passengers in one of the lifts? We’d be keen to hear your thoughts on the availability and usefulness of them and how other airports can follow the example of Heathrow, Gatwick, Newcastle and so on.